A loan note is a legally binding document issued from a lender to a borrower when money is borrowed. Included in the loan note will be details of the loan and the terms and conditions that will be applied. There are many situations where loan notes can be used. If a person were to borrow money from a company or another individual then they may use loan notes as written proof of borrowing. Loan notes can also be used when shareholders borrow money from a company in which they own shares, and companies will often use loan notes when borrowing or lending to each other. Companies can also issue loans to employees that can be redeemed at a later date. Loan notes will often also be used by financial institutions, banks, and building societies. Solicitors or lawyers are usually used to draft up the loan notes if the amount of money is substantial. Individuals can also use legally prepared loan notes but the personal drafting of a loan note between two individuals is not uncommon. As long as all of the terms and conditions are in place and have been agreed by both individuals then the note will be legally binding. The names and addresses of the lender and borrower. The date the loan note was issued. The amount of money to be borrowed or the debt owed, known as the principal sum. The frequency of payments or when the note should be redeemed or expires. Interest rates that are to be applied to the loan or debt. Signatures, dates, and witness signatures if required. Details on penalties for late payments, defaults, and compounded interest. The terms and conditions of the loan or debt should be written and agreed by both parties. Loan notes from companies may come in a standard format with set terms and conditions already intact but no contract is set in stone and there should always be leeway in the terms for both parties. Once the terms have been set and agreed then they cannot be changed at a later date. There may be a clause with regards to amendments to the note but these amendments should not effect the original terms of the loan. It is a legal requirement that all of the terms and conditions included in a loan note are clearly understandable by both parties. If there are any hidden clauses wrapped in confusing legal terms then the note may not be enforced if a dispute occurs. A breach of any type of legally binding contract including loan notes can have serious consequences. Where money is concerned there will usually always be some form of legal consequence including the possibility of court action and penalty fines for late payments. 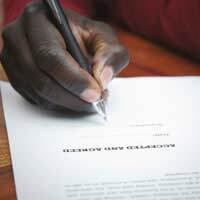 The terms and conditions of the loan note should include clauses on breach of contract and the consequences to an individual or company that incurs the breach. Loan notes will usually have some form of time limit applied. The note can have a redemption date or there will be a repayment schedule included. In some cases there may not be any time limit on a loan note. For instance there have been cases where loan notes were used to help ailing businesses or even financially failing football teams. Individuals, employees or other companies are asked to help to help the ailing business by loaning money, and in return they will receive loan notes that will be repaid sometime in the future. No repayment dates need be mentioned and the only stipulation regarding the time scale is that the loan will be repaid sometime in the future. As long as this “future” time scale is mentioned in the terms and conditions of the loan it can still be classed as a legally binding clause. Like any other form of financial contract, the terms and conditions of loan notes are all important. They can be used for future reference and are evidence of the debt or loan. Loan notes should never be discarded until the loan or debt has expired. I have recently started my own property investment business by drawing down my personal pension fund , establishing and registering a SSAS Pension Scheme. I am looking to raise further capital to secure against purchasing property with potential adding value to re-sell or add to portfolio to retain long term investment. I am seeking guidance to conform a loan note securing funding for clients against the property by holding the funds in a secure client account. How or where can I structure a loan note legally. I have bought and sold property on a part time basis and hobby and wish to turn my hobby into a business module. I am considering my exit strategy from my company 100% shares owned by myself I want to offer the company to existing employees and have been advised this can be done by forming a holding company and issuing loan notes to the people wanting to buy my shares and I can also benefit from 10% tax level on retained profits under the entrepreneur relief scheme Can this be made to work ?